Two years ago this week, I was in Cambridge, England. As an American college student, watching my British counterparts study, ride their bicycles to class, and play cricket at the park, I almost felt like I was looking in a distorted mirror. But after 9 days of living, walking, and studying in this medieval college town, it almost began to feel like native habitat. I can’t give you a Lonely Planet guidebook description. So I’ll just share a series of snapshots that characterize the journey there. 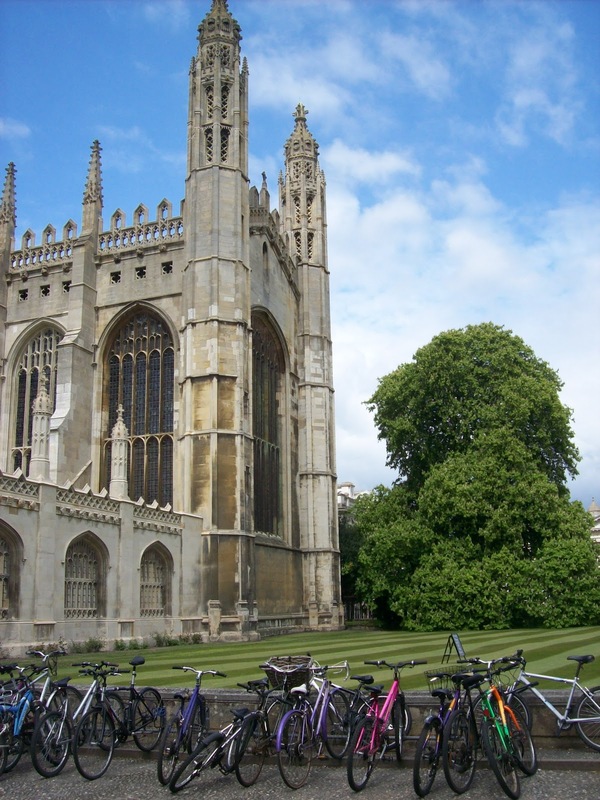 Two structures characterize Cambridge: the tall, Gothic spires of the colleges and cathedrals…and the spokes of bicycle wheels. The medieval streets make driving a health hazard, not to mention an insurance nightmare. So everyone bikes. Little baskets and all. Even in skirts. Knowing my world-class klutz skills, I decided to forgo this traditional mode of transportation and let my good ol’ feet carry me…. 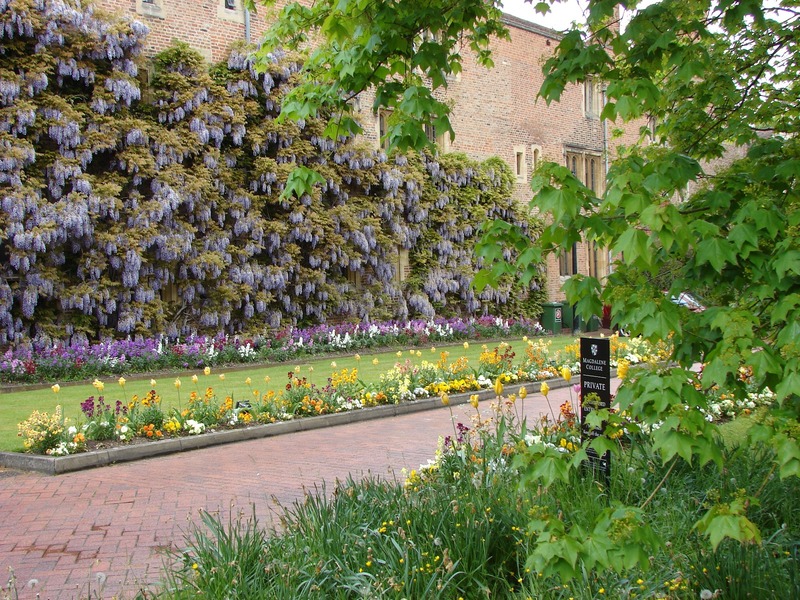 The May flowers in Cambridge are also jaw-dropping. Many of them I had no names for, but I did recognize fields of many-colored tulips and walls covered with wisteria, like this one. 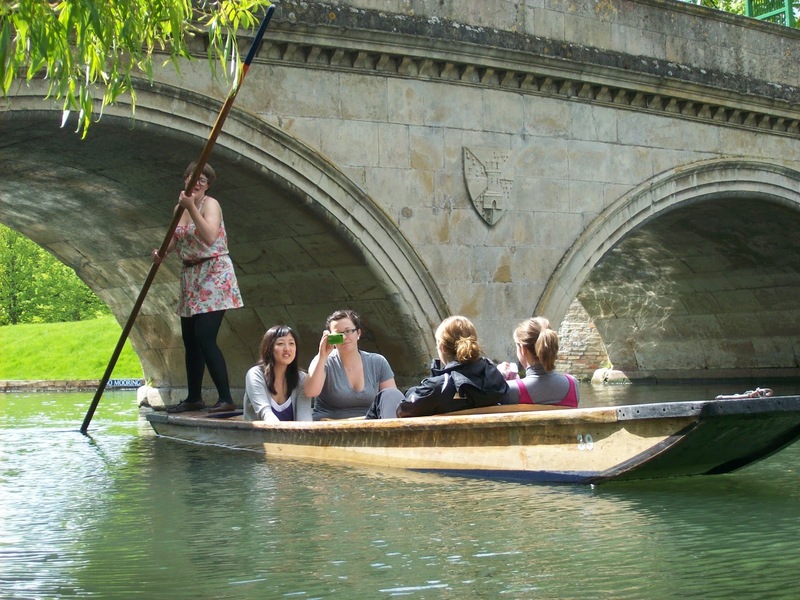 When the Cambridge boys aren’t riding their bicycles to class, they make a little extra pocket money by punting: pushing tourists down the shallow river using flat-bottomed boats and ten-foot poles. They expertly steer their passengers down the river, pointing out all the sights along the way. Our group decided to be economical and do the punting ourselves. Our group was also 90% female. I gave tried punting for about 10 minutes before almost falling in and calling it quits. Those poles are a lot heavier than they look! Possibly the funniest moment in Cambridge: a mother duck and her brood of ducklings decided to cross the street, plunging headlong into traffic. 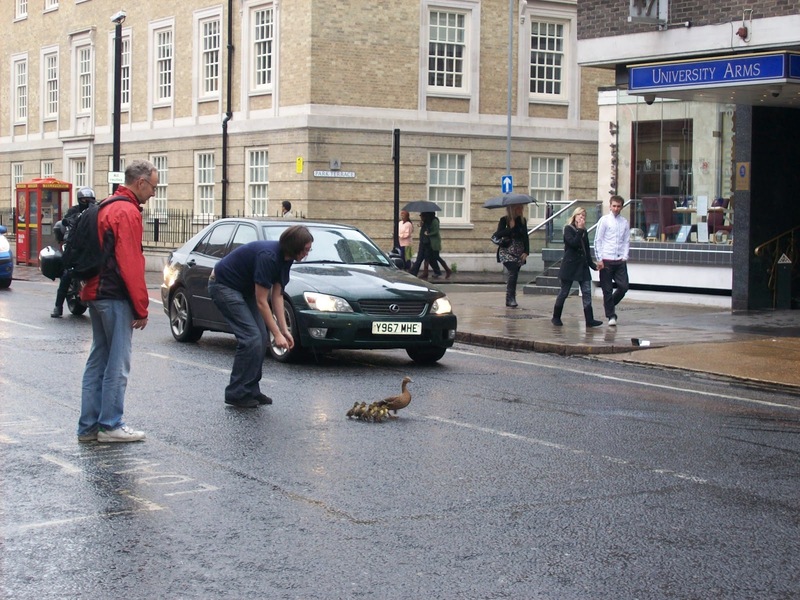 Shopkeepers and pedestrians from both sides of the road darted after them, stopping traffic to “make way for ducklings.” It was rather adorable: a whole street of cars and people frozen in motion as a little family of ducks waddled across the road. Most fabulous teatime: The Orchard. 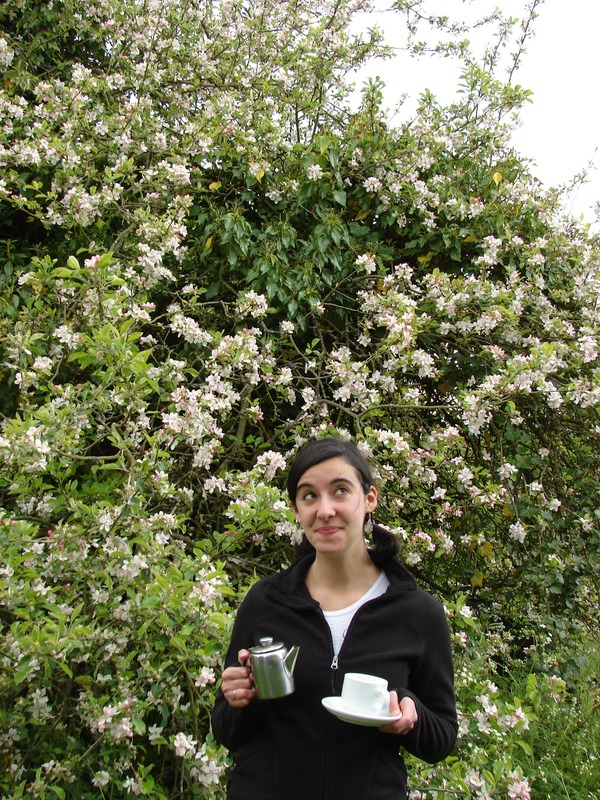 About three miles (on foot) outside of Cambridge, we sipped Lady Grey tea and nibbled scones and clotted cream at outdoor picnic tables under trees frosted with apple blossoms. The sun even decided to grace us with her presence for part of the afternoon. Sweaters came off; some of our group closed their eyes and tanned; some opened books of poetry; some blew streams of bubbles from plastic wands into the air. And last, but not least, the King’s College Chapel choir. We attended services at King’s one Sunday morning under the grand fan ceiling, sitting on carved wooden benches with a Rubens painting at the far end of the nave. And then the boys’ choir began to sing. If I hadn’t been looking right at them, I would have sworn it was an adult choir including both men and women. But listen to them! Surrounded by candles in that vast Gothic space, they sound like a choir of angels. This concludes Episode Three of our Armchair Travel Guide to Britain. Have you been to Cambridge? England? Did you have experiences that you positively have to share? 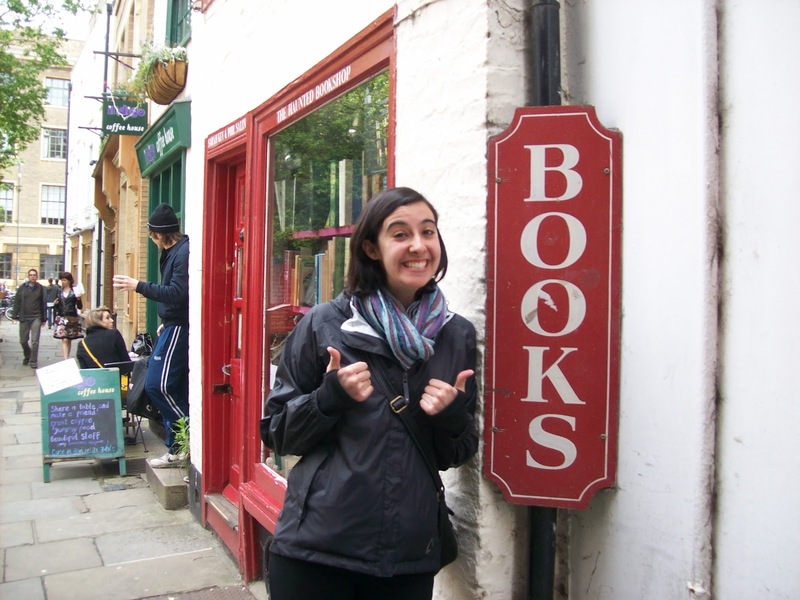 I did a study-abroad term in London while in college. It was both a good time and a bad time–I had some crises going on at the time that colored my experience there–but I’m glad I went. That said, I absolutely LOVED York–my best friend came down from Scotland and I went up from London and we both had a lovely long weekend there. Crazy how college, and especially study abroad, can dig up all life’s junk and dump it out on the table…I’m sorry you had to go through that in London, but York sounds magical! That’s one of the places I just didn’t have time for, but if I ever go back (which I really hope I do) I’d love to visit! That’s how I felt about your Morocco post! I’ve been as far as southern Spain, but would like to cross that border. What a wonderful world we live in! Always more to explore! Some great photos…particularly the duck one 🙂 Thanks for sharing them. It’s been a few years since I’ve been to England (5? 6?) but I could return every year before I pass on. One thing I vow to do before then is learn to drive in the UK. Even on totally empty rural roads I had trouble. Maybe if I try it with an automatic I’ll succeed.